Our water bottle’s contoured shape features finger grips for a comfy hold. Tapered base fits standard auto cup holders. Durable BPA Free PETE plastic side walls resist creasing. This plastic 22 oz. sport bottle is made from 100% recycled post-consumer material. You will love its straight wall design with ergonomic finger grips and flip lid. This bottle is fully top-rack dishwasher safe. Made in USA. Bring nature inside with these distinctive wooden tree ornament The Tree Ornaments are made from olive wood* from orchard pruning from local California orchards. *handcrafted in the USA using recycled olive and avocado tree prunings, we make quality wholesale souvenirs and gifts without depleting the environment. 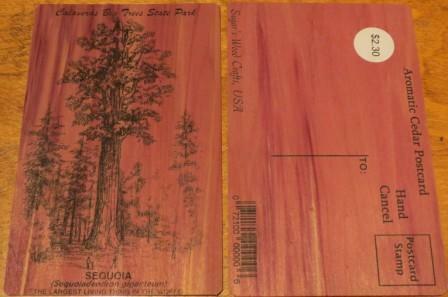 This placemat has Giant Sequoias on one side and an amazing picture of the Stanislaus River on the other. The placemat measures 12″ by 17″. The photos are by California State Parks Photographer – Brian Baer. 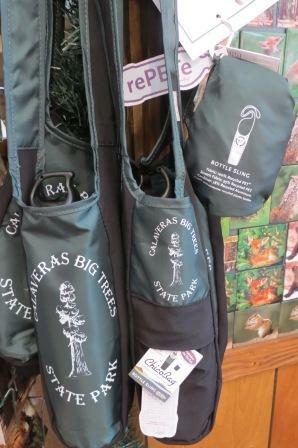 The Bottle Sling rePETe is a perfect complement to your reusable water bottle. It is designed to hold most bottles, including our very own 27 oz. BPA Free sports bottle. The Bottle Sling rePETe also has a large pocket for your iPod, phone or wallet, a small pocket for lip balm or a flash drive and a skinny pocket for chopsticks or a pen. You never really know when you will need chopsticks, especially if you are trying to cut down on using single-use throwaway cutlery. Like many of our rePETe products, the Bottle Sling is made of 97% recycled content. Show your commitment to the environment with our exclusive rePETe products. All rePETe products are made from recycled materials, mainly 100% post-consumer recycled plastic bottles. A printed materials list appears on the inside of each bag and the backside of each pouch so you know exactly what your bag is made of. 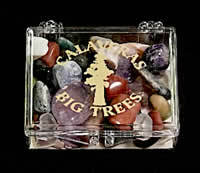 These beautiful boxes are hand crafted in the USA out of Rainbow Poplar wood. 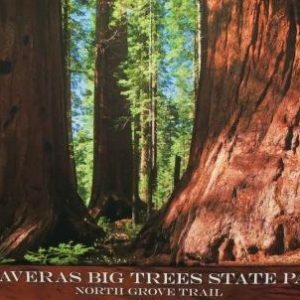 You can choose from either a Dogwood or a Giant sequoia. The boxes measure 3 x 3 x 2.5 inches. Withe a pine engraving interlocking lid. Barkies are a simple tube of seamless high-tech microfiber that can be worn many different ways, depending on the activity or weather, making them perfect for all athletes and outdoor enthusiasts. They are remarkably practical, amazingly versatile and have a gazillion uses… plus they are fun to wear! Barkies are also easy for you to manage. 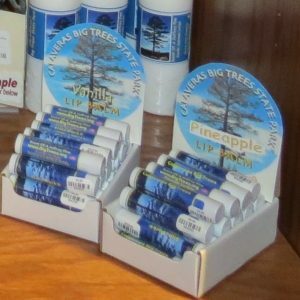 They are light weight, compact, easy to store and ship. 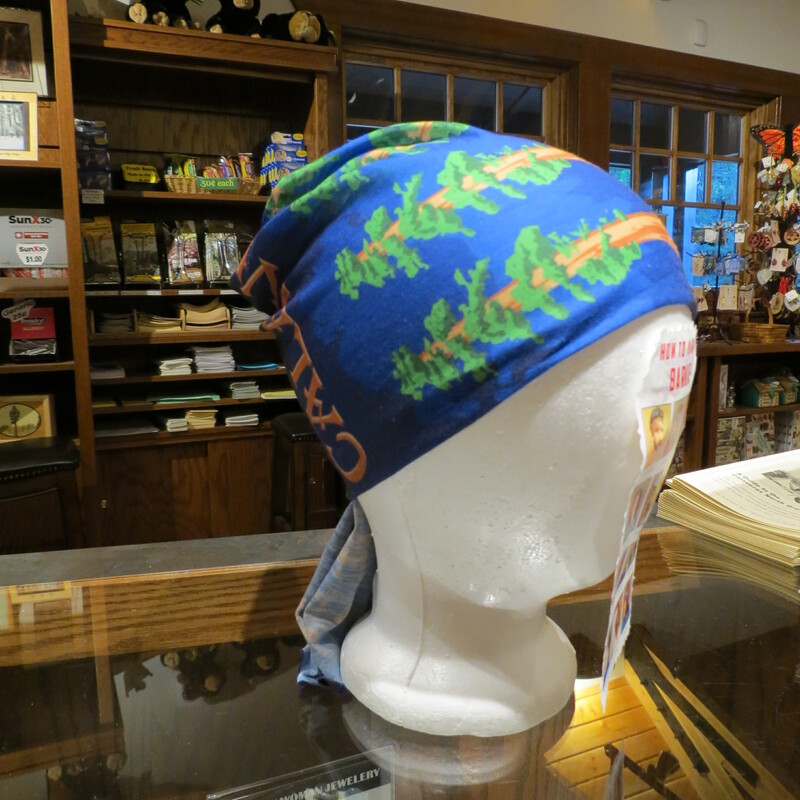 Our multifunctional headgear is the perfect low-cost option. Give your athletes and fans something they will wear over and over again –Barkies for Everyone! This Ornament is genuine 24k Gold flashed Brass designed with Jackson Pacific. 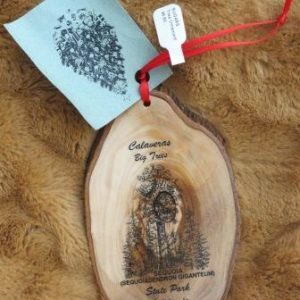 The ornament depicts what you could see on the North Grove Trail, it also includes a story of the Giant Sequoias on the box. 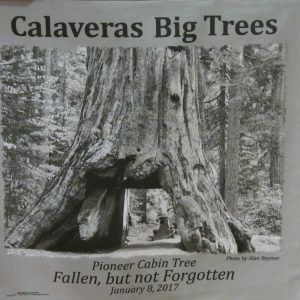 This beautiful bandana has been created from a photo by local photographer, Alan Beymer to commemorate the falling of our historic Pioneer Cabin Tree on January 8, 2017. "Fallen, but Not Forgotten". Order yours today! The scarf measures 21" x 21" . It is a black and white photo on a soft silver-gray material. Simply creative!! Surprise your loved ones at home with a simple greeting on a postcard that will surely get a WOW! They even smell of aromatic cedar! 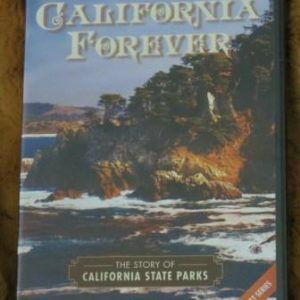 California Forever is a two-part PBS television special that tells the story of California’s magnificent state parks from Yosemite in 1864 to the present day. Together the two one-hour programs remind viewers of the importance of California’s state parks as well as their priceless legacy. 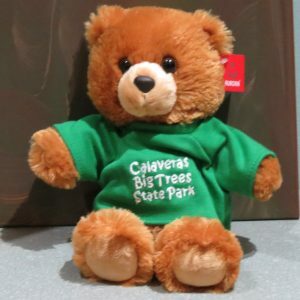 Cute & Cuddly is the best way to describe our Calaveras Big Trees Bear. 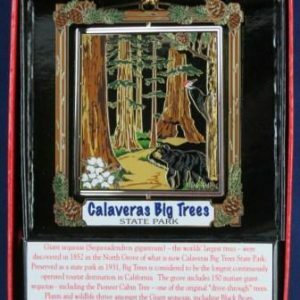 He is super soft wearing a t-shirt with Calaveras Big Trees State Park embroidered on it and is 10” from paw to ear, 7” when sitting. Polished Stones – Tiny tumbled stones – all natural -from around the world.